One of the things that no one tells you is that carving pumpkins is really freaking hard. Tonight my friend Kathy stopped by to say hi — after two margaritas — and pretty darn perfectly carved Barack Obama’s profile in a pumpkin. Damn her. My stars were almost impossible, and Sophie’s pumpkin is a mess. Poor Sophie. I wouldn’t let any 5-year-old wield one of those carving things (Ray thinks they should be recalled, given how easily the blades break off. And they’re sharp). But definitely not Sophes. I did let her draw on her pumpkin after I was done taking her directions. She first said it last week, sitting with Ms. X, making a paper pumpkin puppet on a stick. And so on for the nose, the mouth. Ms. X did better with paper; my pumpkin features were anything but fab. I can’t carve eyelashes. Sophie didn’t seem to mind. Annabelle was pleased with her pumpkin, as well. But the hit of the night, I’ve got to say, was my accidental chalkboard pumpkins. Well, when I was a kid, we didn’t necessarily add eyelashes. Usually only the bigger holes let out light anyway. is “FABULOUS.” her new “good” answer? Years ago, when Ricki was 4, she gave a good answer, “the hammer” to a question of what did Abraham smash the idols with. She saw our enthusiastic reaction (it was the first time she had really answered a question about what she studied in playschool), so for over half a year, she answered EVERYTHING with “the hammer”! I totally know what you mean — Sophie loves to give pat answers. So far that’s the only place fabulous has turned up but I bet we’ll see it more…. 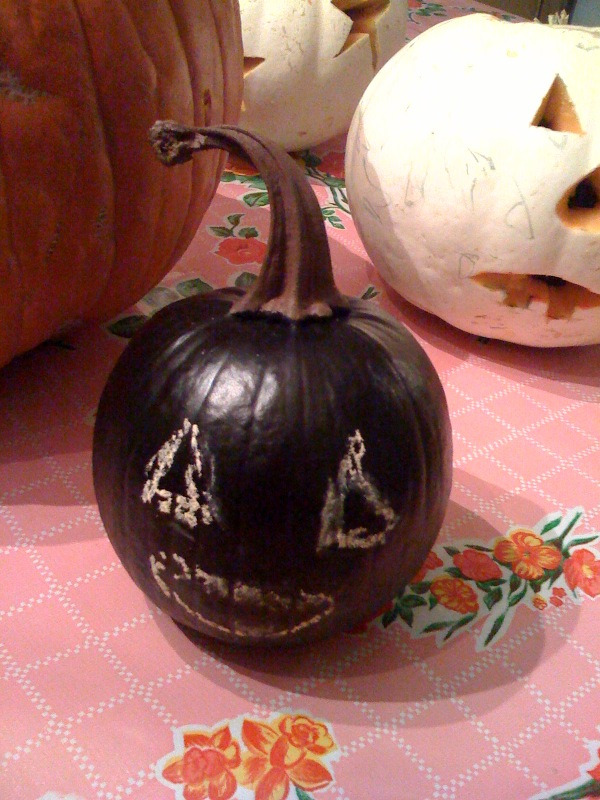 Pumpkin schumpkin: The scariest thing in that pic is the tablecloth. I love the chalkboard jack o’lantern! That is so cool! I love the tablecloth, too! Previous: Is Halloween the New Christmas? Next: Leftover Candy Corn, Anyone?